Welcome back the zero waste grocery store challenge! This week we're taking a look at Grocery Outlet where 99% of everything was wrapped in a package. It was very, very daunting. I did not have much success in any way shape or form. But, I gave it a try! I don't have pictures of the actual groceries I bought because we had a fridge malfunction as soon as I got back from the store. Our fridge decided it didn't want to keep cool any more. In order to prevent as much food waste as I could, I started cooking everything in the hopes that I would be able to prevent our food from spoiling. I think I did pretty well. I only had to compost two things. Justin fixed the fridge, so it's working just fine now. Yay! If you're new to the grocery store challenge, I've rounded up some of my favorite bloggers and vloggers to help me out in different regions all over the US. East: Meredith from Meredith Tested: Trader Joe's, Costco, Hannaford Supermarket, and Wal-Mart. South: Manuela from The Girl Gone Green: will be going to Aldi, Publix, and Wal-Mart. Midwest: Celia from Litterless: will be taking you to Kroger, Jewel-Osco, and Wal-Mart. West: Andrea of Be Zero: will be featuring Lucky’s, Safeway, and Wal-Mart. 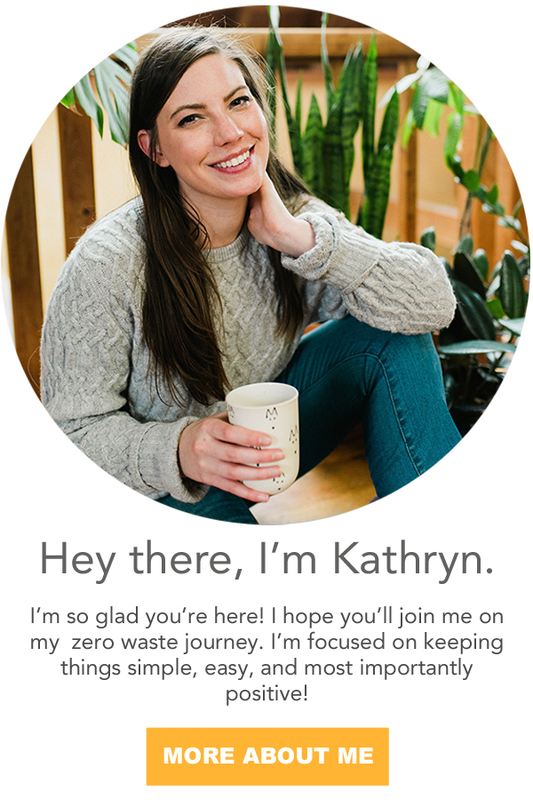 Pacific: Kathryn of Going Zero Waste will be visiting Target, Grocery Outlet, and Wal-Mart. I started this challenge because I'm from a place where there was nothing in town but a Walmart. I have friends who STILL don't have access to recycling. This in no way shape or form should limit them from participating in the zero waste lifestyle. Not everyone lives in an ideal world with ideal access. This challenge is about real people who want to reduce their waste to the best of their ability. I hope that these grocery store challenges will give them those tools. What a nightmare. Almost everything was wrapped in plastic. I haven't stepped foot inside of a place with that much plastic in years, it was like my own personal torture chamber. However, they did have a lot of local food which I thought was pretty cool. I've taken some snaps from around the store to show you what I found. The first stop was the health and beauty aisle. The only thing I could find was Tom's toothpaste. They take their packaging back through Terracycle. Of course if you're feeling like tackling an easy DIY, I'd highly recommend you check out my tooth powder and mouthwash recipes. The next stop was the produce section which was very disappointing. Everything organic was wrapped in so much plastic. The conventional produce had less packaging, but some of it was wrapped too. I thought this lettuce was pretty cool. It has the roots still in tact. So, ideally you could buy this lettuce and never have to buy lettuce again. It didn't feel like there was much winning at this store. If this were your only option in town, I would definitely recommend looking to see if a CSA services your area. If you aren't familiar, a CSA stands for Community Supported Agriculture. Typically, local farmers will deliver a box of fresh, in season, fruits and veggies to your door step. This is a great website to look for farmers markets or CSA's in your area. I did buy several lemons, avocados, and tomatoes! These babies came naked. They also had an entire shelf dedicated to lonely bananas. Lonely bananas have a 60% more likely chance of being thrown out than bananas in bunches. So, grab a lonely banana, and check out the catchy song I wrote to help you remember. So much packaging. But, I spy some semi-naked greens and beets. I also spotted some kimchi in glass! Rainbow Grocery has kimchi in bulk, but I don't make it out there very often. It's great to know that this is an option. After hitting up the produce section, I went to dairy. Surprisingly, they had vegan cheese! Of course, I had to try some. Growing up allergic to dairy, there were very few non-dairy options available.. especially in the middle of Arkansas. I feel like non-dairy items started becoming really popular around the time I went zero waste. During this challenge, I've allowed myself to get a little crazy and try some new fun things! 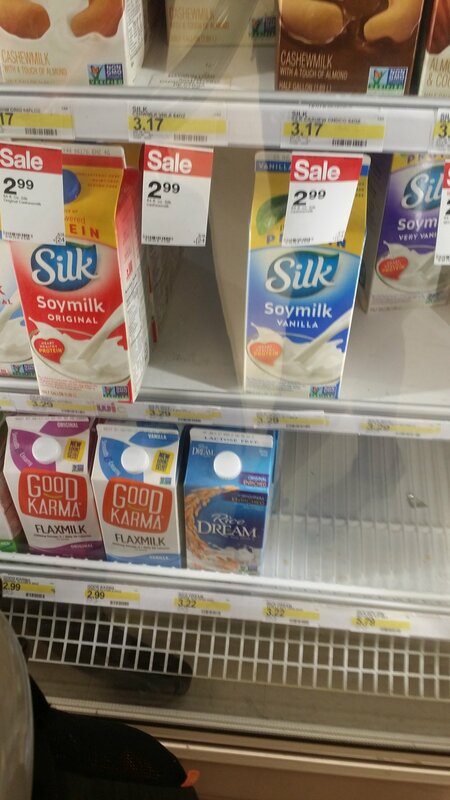 I could only find soy milk in a tetrapak and decided to pass. Justin wanted cow milk and there weren't any good options packaging wise, but they did have local, organic, from a farm whose practices I support. That was nice. I also noticed a large selection of egg cartons that can be recycled and composted. Just make sure to remove the sticker. Also, they had several Certified Humane. After the dairy section I wondered to the bread. I wondered the perimeter of the grocery store where you're most likely to find package free food. I picked up a loaf of organic sourdough made in San Francisco. It came in a plastic bag #4 and I will recycle it at the top of the grocery store with other grocery bags. Be on the look out for the final report post where, I'll weigh all of the trash and recycling that I've made in the past couple of months during this challenge. After, I picked up bread it was time to head into the aisles to see what I could find. The first aisle I turned down had a lot of legumes packaged in plastic #4. I stocked up on black beans, garbanzo beans, and pinto beans. It's really easy to make veggie stock out of food scraps. You can get my recipe here. I always like to keep it on hand in my freezer. But, if you're in a pinch and need some, always go for a can instead of the tetrapaks. Steel cans have almost a 100% recycle rate and can be back on the shelf within 90 days of being recycled. The next aisle I wondered down had pasta in boxes, soups in cans, and pasta sauce in glass jars. The next aisle I walked down had a lot of California products. Glass is great because it's infinitely recyclable without losing quality. That being said, glass is really heavy! When it's shipped it has a much higher carbon footprint because it uses more energy to transport. While I still believe glass is always better than plastic, buying local goods helps to off set this. I was really proud to see a good representation of California goods at the store. Other things I bought that aren't mentioned here are 2lbs of ancient grain mix and some organic salsa in a glass jar. The ancient grain mix was full of millet, quinoa, and amaranth. I use these grains to prep lunches for work. Unfortunately they came in a zippered pouch. I'm not sure if it's plastic #2 or #4, but I'll find out. This was my trip to Grocery Outlet. I'm very much looking forward to doing Walmart with all of the girls involved on this challenge! Throughout the next couple of months, I will be working on the Zero Waste Grocery Store Challenge. I'm repping the Pacific US: "Hella, Dude, Cowabunga." ...although most of my grocery stores are national. -East: Meredith from Meredith Tested: Trader Joe's, Costco, Hannaford Supermarket, and Wal-Mart. -South: Manuela from The Girl Gone Green: will be going to Aldi, Publix, Thrive, and Wal-Mart. -Midwest: Celia from Litterless: will be taking you to Kroger, Jewel-Osco, and Wal-Mart. -West: Andrea of Be Zero: will be featuring Lucky’s, Safeway, and Wal-Mart. Follow the #ZWGroceryChallenge on social media and join in! Share your triumphs, challenges, questions, and requests! Here's the deal. Yes, it is absolutely ideal to buy all of your food from bulk with as little packaging as possible. It's ideal to buy from a local shop in your community that obtains all of its goods from local, sustainable organic farms. But, I'm going to say this again for the people in the back, NOT EVERYONE LIVES IN AN IDEAL WORLD. I have received several not so nice emails from several readers explaining how awful all of these grocery stores are and how this destroys any goodwill I've put out in the world for the store's lack of ethical, social, and eco ethos. Instead of focusing on being perfect, I want to focus on making sure low waste options are accessible to everyone. Not everyone has a health food store in their town. This blog is NOT about being perfect. This is NOT a place for judgment. As Meredith says, I am not trying to win zero waste. This is NOT a competition. This is about doing the best you can, where you are and sometimes that's Walmart or Target. 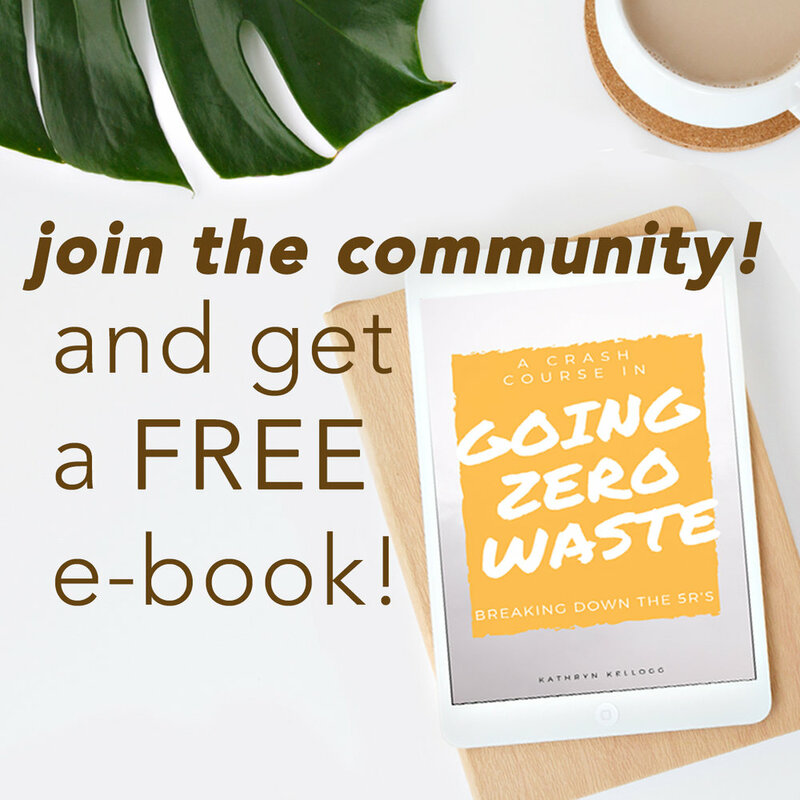 I want the zero waste movement to grow far and wide. I want everyone in the world involved, and it's important we don't limit zero waste to only those who have access. We shouldn't limit it to only those who are perfect. Everyone can make a difference. Everyone can make better choices. So, I want to show you some of the better choices when it comes to Target. I started this challenge when I realized my local grocery store is closing. The only grocery stores I have in town are bargain markets like Smart and Final, Grocery Outlet, Food Maxx and big box stores like Super Target and Walmart. A lot of these stores lack a large selection of healthy food. The local grocery store I was going to, Raley's, had a small bulk section. I now have no local offering in bulk, and I officially live in a food swamp. "A food swamp is an area where there's an overabundance of high-energy, low-nutrient foods (read: fast food) compared to healthy food options. Low-income communities are usually the swampiest, with nearly twice the number of fast food restaurants and convenience stores as wealthier neighborhoods." I am so grateful for our farmers market where I buy the large selection of fresh produce that is year round. I completely realize how fortunate I am. A lot of folks don't have it as good as I do, so for that, I feel very fortunate and blessed. Our community is also working on opening up a co-op which will fill a huge void in our city. If your city is also missing wholesome, good food, you might be the solution. Maybe it's your job to fill the void. Don't be afraid of starting a co-op! A lot of co-ops start out of people's garages. Go in with some neighbors to get large quantities of good whole food delivered to your door. Please check out what I bought and why I bought it. I did supplement with my farmers market haul this week because the produce section was severely lacking!! At target I spent $80. Which is WAY more than I normally spend at the bulk store when I stock up on dry goods, but I did buy a lot of specialty items I don't normally buy. With all of these groceries I plan on making nachos, hummus, veggie burgers. PB&J, grilled cheese, chocolate chip cookies, veggie lasagna, pancakes, summer salads, and oatmeal. Instead of getting small individual bags of popcorn go for a large container of kernels. It was plastic number one so it has a really good chance of being downcycled. This almond butter is from California and it comes in a glass jar that can easily be reused. Egg free mayo! It does come in a plastic jar, but I'm glad it's carried at target. I do still eat eggs, but I only eat them when I know the chickens. Flour and sugar still comes in paper. Overall making your food is one of the easiest ways to reduce your waste. Eat whole, real food. I was surprised to see loose leaf tea tins. The tea most likely is wrapped in plastic on the inside. But, it's way less plastic than individually wrapped tea bags. Most of which have plastic in the tea bag itself making them unable to compost. Pasta sauce comes in glass jars which are great for reusing. Even if you don't need the jars list them on a sharing site online. I'm sure someone will gladly take them off your hands to reuse! 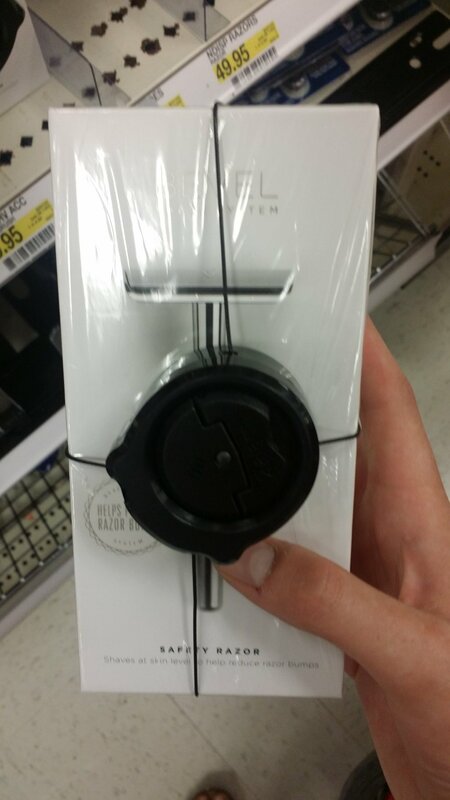 Target has a safety razor for sale!! Safety razor blades. I really can't tell what the packaging looks like on the inside. The Tom's brand beauty products can be sent back to terracycle to be recycled and reused. 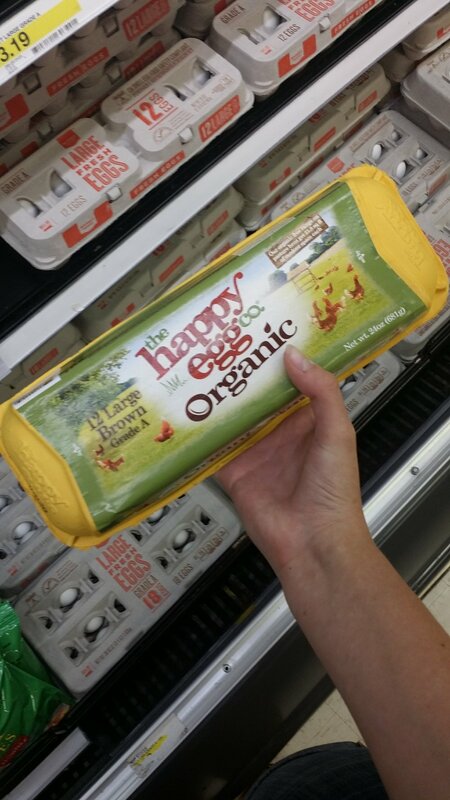 Certified humane eggs that come in a carton that can be composted. You will have to remove the sticker which is trash. Justin always buys me this soup when I'm sick. 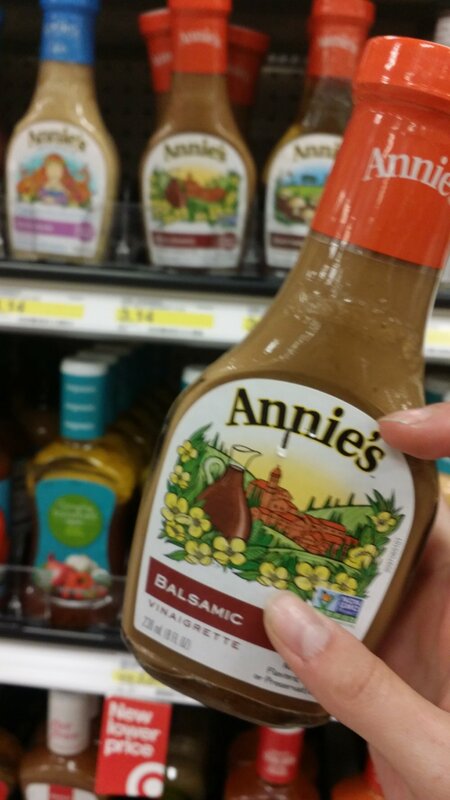 It's great to know that Target carries it and a large selection of Amy's. Target had a decent selection of apples. And, they had a basket of lonley bananas. The rest of the produce cart was severely lacking. Organic spices that come in glass jars. Salad dressings that come in glass jars, but honestly if you can make your own salad dressings (especially a vinagrate!) I would reccomend it. I think it's great that these bags let you know you CANNOT recycle them. All packaging should be clearly labeled what it's made of. I chose this over the TetraPak carton because the TetraPak's are not recyclable curbside in my town. The best option would be to buy the almonds and then make my own milk. The giant jug of almonds I found. They come in plastic number one, but it would be a great jar to reuse especially in the jar for holding all sorts of nuts and bolts. The cheese selection was slim. I talk about it in the video more. It would be best to buy a block, but they didn't have any cheese in blocks I wanted to support. These mushrooms, although wrapped in plastic, come in a cardboard box instead of stryfoam! Oils and Vinegars all came in glass. I would definitely opt for dry pasta instead of fresh. The dry pasta comes in a cardboard box that can mostly be composted. There's more detail on that in the video. I hope you enjoyed this zero waste challenge. I will be keeping track of ALL the recycling, trash, and dry compostables (paper, not food scraps) throughout this challenge. Next month I'll be taking you to Grocery Outlet. Let know if you have any tips!